Learn how to build websites and designs for nonprofits that help with fundraising and capital raises. Marketing and advertising look very different for nonprofits than it does for other companies. Instead of raising awareness for a product or service, you’re raising awareness for a cause and hoping to move the hearts of others to join your cause. If you’re looking to get the word out about your nonprofit, this guide is for you. We’ll cover the following topics. Start meeting your fundraising goals with leading marketing and advertising now. Nonprofit marketing and advertising are all about awareness. Fundraising is a bit of a funny thing because in many senses, it’s just like sales and yet marketers are more sheepish about putting the call to action front and center on marketing materials. You shouldn’t be sheepish about fundraising. Viewing donations as sales might help you reframe your thinking about marketing and advertising. The first step in your journey of creating awareness for your cause is through SEO. Before you can take a good look at your website and what you need to improve for SEO, you need to know how people are searching for you. More than likely, donors aren’t searching for your organization specifically when they have no prior relationship with you. Your goal is to think like a donor and figure out what they are looking for. Head over to Google Keyword Planner and start with your broad nonprofit topic. So for example, input “nonprofit for elder care.” From there, Google will help you understand what other related search terms you might want to consider, such as “elderly organizations.” Once you know common search terms for how people might be looking for nonprofits like yours, you can create a spreadsheet of terms you’re going to target. Relevance: is it a long shot that you’ll rank for the keyword because it isn’t as relevant as others? Search volume: how much monthly search volume is there and is it significant enough to bring in donations? Difficulty: some keywords, like longtail keywords, are difficult to rank for. You might start with the low hanging fruit and focus on easier keywords first. Competition: is your competition fierce for a keyword limiting your ability to rank? If so, consider focusing on more attainable keywords first. Page titles: make sure your most relevant keywords appear in your page titles. This shouldn't be forced though. If it feels unnatural, don't do it and don't repeat the same keyword over and over on your page titles to try and rank. Headings: headings tell search engines what content is essential. You can use headings to show this relationship so be sure that you’re headings follow a standard hierarchy on the page and that crucial information is contained within them. Image alt text: your images should relate back to your topic clearly, which means your image alt text should make it evident what your topic is and how your image relates to it. Meta descriptions: your keywords should appear within your meta descriptions for the page. Make sure every page has a meta description and that you’re using it wisely. Remember, this text is what shows below your page title in your search engine results so use this space strategically. URLs: the URLs on your website do matter. Make your URLs match the structure of your menu items so that relationships of pages are clear. Don’t allow your website to insert a string of characters instead of the page title. Your URLs should be your page title separated by dashes instead of spaces between words. Avoid duplicate content: try not to copy and paste over content from one page to another. If the subject matter under one heading on the page is similar to another, you can keep the general concept, but don’t copy it word for word. Search engines don’t appreciate this. Use an SSL: secure websites give visitors peace of mind. Since you’ll be transacting on your website to accept donations, this is especially important. It costs a little extra to have a secure website, but it’s worth it, in the long run, to have your website show up as https. Social media is such a powerful tool for nonprofits. The most powerful nonprofit marketing is storytelling, and social media is the perfect platform for storytelling. You’ll want to use the social platforms to their advantage though as each is a little different. Here’s a look at strategies for each. Nonprofit marketing and advertising should include Instagram in your strategy. With 600 million people on Instagram, there is so much potential to reach your target market with your message about your cause. The platform’s largest demographic is the 18-29-year-old range, but you’ll also find a large portion of 30-49-year-olds. Instagram is designed for mobile devices and makes sharing photos and videos easy. There is minimal emphasis on the caption on Instagram and more air time is given to stunning graphics. It’s the perfect storytelling platform. The New York Public Library does a great job on Instagram, and its audience of 340,000 followers makes that evident. From content about what happened on this day many years ago to quippy captions on theater performance posts, the profile provides a little bit of something for everyone. They aren't just broadcasters though. Their posts receive a high amount of comments, and the team does a good job interacting with followers. Facebook offers access to a plethora of individuals from various age groups. Because it’s so widely used, it’s a good place for reach sympathizes to your cause. In fact, 47 percent of the people on Facebook support a cause using the social platform. Cause marketing can use facebook to generate awareness and donations. Armed with those details, you now have to decide how to use Facebook. It’s a strong platform for storytelling, which can help nonprofits showcase the impact that they have in the community. According to Kissmetrics, photos on Facebook get 53 percent more likes and the number of comments more than doubles compared to text-only posts. You’ll also get 84 percent more click thrus, which means you could get conversions into donors. The best way to discover what content works is to test it. Facebook offers insights into how photos, videos and link posts perform with your network. Use those statistics to drive how you use the platform, but ultimately, use a mix of content types to keep your audience engaged. [The Make A Wish Foundation of America shares their story on Facebook with photos and videos that make you pause and think. The stories they tell are both about the children's lives they impact with a wish and the children waiting to get their wish. These children all face difficult roads ahead due to serious illnesses, and the wishes they receive can be the highlight of their life that's cut too short by illness. A nonprofit marketing strategy should include youtube to bring your cause to life. YouTube boasts more than a billion users and now surpasses cable TV for reaching the most people in the age range of 18-49. With video, you can tell your story and the story of those who benefit from your services. Because YouTube is all videos, it legitimately makes your nonprofit come to life with content and storytelling. ASPCA has more than 25,000 subscribers. It tells the stories of the lives of pets and their owners who are displaced by natural disasters. Their stories have as many as 2 million views on just one video. The reason it works is because the stories are told well and make it clear the benefit the nonprofit brings to the community. Nonprofit marketing ideas can be creative using pinterest. Pinterest can help you gain brand recognition because you can categorize your content under different boards that interest your followers who then add it to their boards and continue to grow its awareness. As far as its user base goes, it is one of the smaller social platforms with 150 million users, but that doesn’t make it less impactful. The audience on Pinterest is predominantly female, which means if your nonprofit receives more recognition and following from women, this is an excellent platform for you. A nonprofit that does a great job on Pinterest is clean: water. The team offers a board of creative fundraiser ideas. The ideas range from using a nonprofit instead of a wedding registry and much more. By sharing creative ways to make an impact, the nonprofit can create sympathy for their cause. While digital marketing is a great place to reach people inexpensively, it's also a cluttered and densely populated space with companies and organizations all trying to find air time. Because it's so densely populated, sometimes nonprofits benefit from going with traditional marketing to get their message across. Print marketing still has its place for nonprofits. Just like each digital marketing platform has its strengths, so does each type of print marketing. Here’s a look at how to use each one of these print marketing pieces. Postcards are an excellent way to keep in touch with your donor base, but there is a cost associated with printing and mailing postcards. Use them strategically to reach your donors and earn donations. Here are a couple of ideas on how to use them. A progress report: share where you’re at in a campaign. This can help people feel motivated to support your cause and help you reach your goal. Showcase success: if you launched an initiative recently that your donor base helped make a reality, share your success so they can feel good about the difference they made. Introduce a new campaign: if you have fundraising goals for a new campaign, a postcard can help you share your new campaign with your followers and get them involved. Consider a tiny URL that goes to a campaign video sharing what it’s all about or other interactive media to help you inspire your donor base. Encourage year-end donations: toward the end of the year, people begin their tax preparation planning. If they have money to donate, this is the time to get in front of them with information about your cause and what you do in the community. Much like postcards, mailers provide an opportunity to share good news and get people behind your campaigns or causes. Mailers often cost more than postcards though so use them strategically. You might create fancy mailers for your larger donors who you believe will have a more significant return on your investment in the mailer. The benefit of mailers is that you can have a unique design or shape that makes your piece of mail stand out from the pile of other print marketing. Mailers can be a nice addition to your campaign goals as you work to start a new arm of your nonprofit or open a new location using donor dollars. Fliers are easy to customize and inexpensive to produce. If you're featured at a gala or community event, you can bring a flier with you to share who you are and what you do. Your flier can be quick facts about your nonprofit or details about your current campaign so people can get behind your cause. Have a designer create a template for you that you can then customize according to your audience or event so that you can reuse it. Give your flier plenty of white space and don’t go overboard with text. Because fliers have tons of real estate, it’s tempting to use all the space for text, but refrain from making it feel overwhelming. Newspaper ads can bring awareness to a local fundraising event or campaign you’re running. Because newspapers are paid advertising, you need to be confident you’re reaching the right demographic for your cause. Ask the publication for these insights before choosing to run an ad. Generally, newspaper ads are black and white. Make sure that your content lends itself to a black and white ad. Keep it simple and draw people in with bold statements or statements that are relatable to the audience so they feel compelled to read further. Make your ads trackable by using a custom URL so you can see what traffic came from your ad to know if you should keep running print ads. Videos help nonprofits bring their story to life. Because donations are highly motivated by people feeling connected to your cause, videos can help you build that connection to maximize your donations and involvement. As you think about how you integrate video into your marketing campaign, here are some top nonprofit video ads and why they’re so great. The Rainforest Alliance created an entertaining and captivating video on how to make a difference in protecting the rainforest. The ad has 5.5 million views on YouTube because of its entertaining nature and messaging. The ad goes through a ton of different ways you could make big moves in your life to preserve and protect the rainforest. But they involve life changes that are too big and unrealistic for the average person. Instead, the ad tells you how to do something small each day by choosing products that have a frog on them showing respect and care for the rainforest. The ad moves at a good pace and keeps you interested thanks to strong imagery and movement. This video shows the impact of girls who live in poverty and the cycle of poverty it creates. By helping one girl stay in school, get an education and care for herself and later on for her family, you can change the world. The video uses animated graphics to tell a story. Without a voiceover, you are taken through the story by words on the video that are integrated into the life of the young girl. It's powerful because it includes statistics that make you think and solutions that seem small but are so impactful. The video has more than 2 million views on YouTube proving its strength and its reach. First Descents helps young adults fighting cancer by giving them adventures to focus on their healing process. It builds community and takes these young adults away from feeling low and alone in their cancer journey. The video tells the story of cancer survivors and the impact that First Descents is having on their lives. The video is real, but it also shows the fun and adventures that the nonprofit provides for these young adults, so it's captivating and exciting. Your organization competes with thousands of other organizations for the attention, empathy, and support of your community. So how do you connect the right people with the causes? It’s all in the personalization of your messaging. Whether your focus on renewable energy or rescuing pets, making your message resonate with your audience comes down to speaking their language. Let’s use the pet rescue organization as a sample for a moment. What if you could allow people to donate to your cause in the name of their dog. The rescue organization would name one of their pets after yours and share that pet’s journey with you. Now, you might be thinking, “no way, I don’t have time for that.” Hang with us because at the end of the guide, we’ll talk about the tools that can make this possible. For now, we’re just inviting you to dream big with your marketing and find ways to meet your donors right where they’re at. Here’s various ways to use personalization to reach your audience and grow your donor base. Your challenge as a nonprofit is to set goals and develop campaigns around those goals. Let's go back to our animal rescue story. Maybe this rescue team needs a new facility or a facility expansion to serve all the homeless pets at risk of being put down. Statistics are powerful in these campaigns so you can show how many animals have been put down in the past year at other shelters, which showcases the importance of the work you do. Now your goal has a purpose. Maybe it's a 100,000 campaign that helps 1,000 animals each year. So break it down for people with levels of achievement to motivate people to help you to the next campaign level. For example, level one could be the groundbreaking, level two the building and level three the amenities to bring the project to life. Now you can build in personalization to show your donors their impact. Last year your donation of X helped us do Y. This year, we’re looking for this from you to help even more defenseless animals in the community. Lead with thanksgiving for what you’ve been given already and then follow with the ask. It can be even more impactful if you can show other ways to get involved before asking for money. Maybe it's volunteers to help offset your current costs to get to the point of putting more money toward the campaign. Or, you could get volunteers to help you prep the land for construction or complete the painting once your facility is complete. People like to have a hand in things more than just giving money. Segmentation allows you to speak directly to your audience and their situation. For example, if you know that a person on your distribution list is especially passionate about cats and their welfare, you can tailor your messaging, graphics and statistics to be all about cats and how your shelter will change the lives for those animals. Another way of segmenting is based on geography. If your campaign or project is based on a specific geographic location, it can help to target those people more specifically then your full list. The subject will make more sense to them. Because you know what your donors have given in the past, you can also use that data to suggest what to donate this year. If you ask everyone for $20, you might get $20 from everyone. Whereas if you ask for an amount that fits the budget and income of each person, you might get even more. Donors want to know their impact. So when a new person joins your cause, don’t just send one thank you email that lists how much they gave for tax purposes. Instead, put them into an email journey that shares stories and the impact your organization has. Be there as a constant reminder of what you do so that when the time comes for you to ask for more money, they know more about you and feel connected to your cause. Repeat donors are the primary opportunity that you have. Going out and finding new ones takes more work than just keeping around the ones you have with strong nurturing programs. Depending on the size and bandwidth of your organization, this may or may not be a task you can complete but handwritten thank yous show just how much you care. It’s the ultimate personalization because it shows your dedication to them as a donor. Maybe you need to set a threshold for how much money someone donates to get a handwritten thank you over just an automated email thank you. This can help you bring back donors year over year as they feel important. You could get volunteers to do this for you. Providing an annual summary to your donors can make them feel involved in the cause and show how you use the money they donate. No one wants to discover that their money only went to overhead or supplies. Show the impact each year to encourage further donations. You can deliver your annual summary in a variety of ways. One is a mailer to someone's house with their tax receipt. Another is via email, but you can make it pretty fancy in an email. Use an online tool to make it look like a magazine or add graphics that make your PDF engaging. The key to this aspect is to deliver something special to your donors and the community to show your dedication and impact to the cause. Your website is the hub for online activity and donations. It’s where people can go to get involved with your organization either financially or through volunteering. You should make it as easy as possible to get involved, which means having an outstanding online presence. How you present yourself will dictate whether or not individuals feel safe donating on your website or compelled to join your cause. Here’s a look at some of the best websites and why they work for the nonprofit. a nonprofit marketing plan must have a strong website. Shatterproof is an organization that helps people fight addiction. The website has your everyday menu navigation as you would expect, but it also features three key buttons to help the organization tell its story. One gives you the option to subscribe so you can stay in contact with the nonprofit. Another tells the stories of those who have lost their lives to addiction so you can connect and understand the impact the organization has. The final button invites you to join the cause through donation. The website does not only serve donors though. The “learn” section of the site is dedicated to resources for those struggling with addiction to help them escape from the disease. It also includes information for loved ones to help them navigate helping those they love to end the cycle of addiction. The website does an excellent job of catering to the various audiences while still telling stories and accomplishing their mission. Nonprofit marketing needs a firm foundation of a solid website. 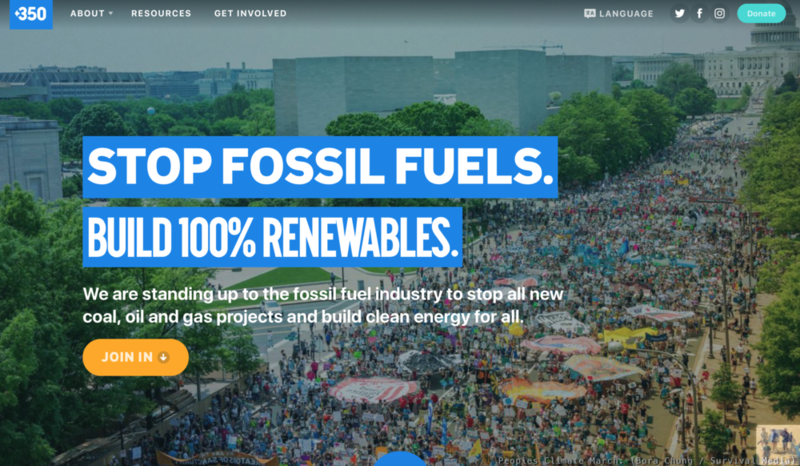 350 is an organization that works to encourage renewable energy so that there is clean energy for everyone. The site uses a variety of multimedia to tell its story. From scientific information reformatted into visuals to a map of local meetings to get involved, the site invites its visitors into the movement to make a difference. The Get Involved page has a variety of ways to support the organization from donation to opening a local chapter of 350. That way, it has a little bit of something for everyone who comes to the site depending on your current ability to help. No matter what page you’re on, there’s a button at the top labeled Donate so that you can easily see how to make an impact. Social icons in the upper right invite you to follow the cause. If you can’t get involved or give right now, following on social media is an opportunity to stay connected until you can. Gain nonprofit marketing ideas from other great organizations succeeding online. 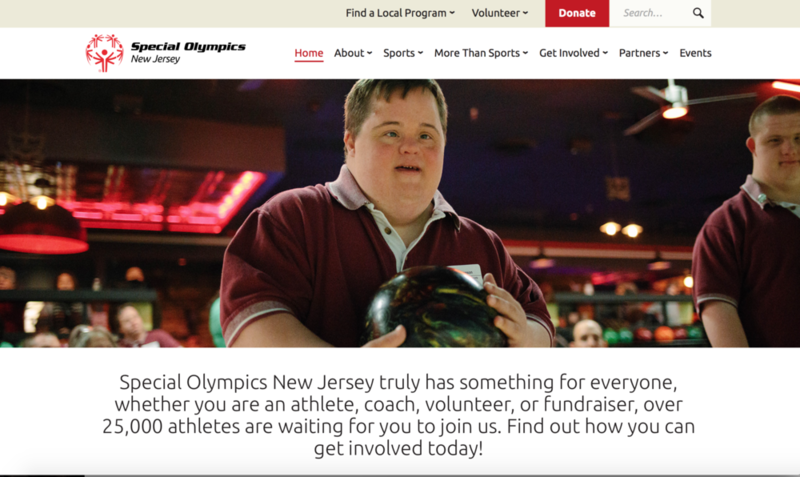 Special Olympics New Jersey offers those with disabilities the chance to compete in sports and build their confidence and social network. The stories page takes you on a journey of the life of one person touched by the organization. With photos and written text, the stories bring to life the work the organization does to help those who need it. The website does an excellent job of explaining the many benefits of Special Olympics for the athletes. It isn't just about sports but also leadership, health, and bringing families together. The website does an excellent job of making it clear how you can get involved. From attending sporting events to cheer for the athletes to donating to the cause, the involvement opportunities apply to everyone. Technology can power your nonprofit to provide an outstanding experience for your donors, volunteers, and community. Personalization is possible thanks to technology and insights. There are two main pieces of technology that you should think about for your nonprofit: marketing automation and donation platforms. Evaluating software is time-consuming and difficult so here’s a look at some of the top software in each category. MobileCause provides nonprofits marketing tools to reach their donors. The platform integrates your marketing initiatives across text messaging, email, phone, and social media. You can manage your full marketing plan from one platform, thanks to MobileCause. Salsa Labs provides email automation, social media, and analytics so you can interact with donors with helpful insights. These insights can inform you as to what you should start doing, improve or stop doing in your marketing plan. The platform won’t break the bank too much for nonprofits either with plans starting at $179 a month. 360MatchPro helps your nonprofit find matching gifts so you can maximize your donations. You can send emails to many people or just one using the email marketing part of the platform. Personalization in the platform is strong, which means you can do more with your marketing. Fundly was designed as a crowdfunding platform but has many options to help you accept online donations on your website. Fundly can serve as your CRM or integrate into it so that you can see more about who your donors are. With Snowball, your nonprofit can accept payments via text message, your website or email. Once a donor has set up their profile, they can donate with just two clicks. The less friction you put between your donors and you as far as donating the more likely you'll be to get donations. We provided an overview in the last section about Salsa Labs and its automation functionality. It also has options to tie it in with your CRM and create branded donation pages so you can accept online donations.